There's plenty of things to do over at Mystery Island, such as training or shopping. 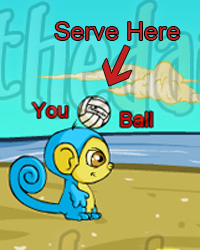 Some neopets would rather just have fun though, so any time of year you're sure to find some Myncis on the beautiful beaches enjoying a game of volleyball! Sounds simple, right? Now that you know about the basics, let's tell you how to play. Player One uses the Left and Right arrow keys to move left and right and the Up arrow to jump. Player two uses the z key to move left, the x key to move right and the s key to jump. The jump key is also used to serve the ball. The game consists of several rounds and after each round, your opponent gets better at the game. You get points at the end of each round you win, 10 points for each point more than your opponent and 50 points for winning the round. If you lose the round, you get 5 points for each point scored. Giant Net The net becomes bigger, mostly in height. It is now harder to knock the ball over the net, which could be good or bad. This could set back your opponent, but if you have trouble getting the ball to that height yourself, I would try to get a different power up immediately. Small Net The net is now very short! It is now easier for you and your opponent to get the ball to the other side of the net. Just like the Giant Net, this could help you or hurt you. Super Size As the name suggests, your Mynci grows to Super Size! It is now easier to hit the ball, but it is easier for the ball to get stuck behind your back. If your opponent has the Giant Net power up, you will now be proportional to the net and it should be no trouble for you. Super Speed You become very fast! This can help you a lot if you are having trouble getting to the ball, but don't over do it and run past the ball! Super Jump This makes you jump very high. This is usually a bad power up to have because you can jump over the ball and the ball becomes harder to serve. If your opponent has it, then great! Have fun watching them score on themselves. Giant Ball The ball becomes very big, which makes it easier to hit but it has a higher chance of hitting the top of the net. Turdle A turdle walks onto your opponents side of the field. If they touch the turdle, the turdle will hold them in place for a few seconds. Take advantage of this opportunity! If your opponent gets this power up, avoid the turdle if possible! When you are serving the ball, try to hit it on the left edge of the center cloud, like in the image below. This tends to give better results, especially on the first level where the opponent isn't too smart! Have patience with the game! You may think that the game will move quickly after Round 1, but when the opponent is better, it may take a while for a point to be scored. Work at a good pace and focus on keeping the ball off of the ground rather than scoring. This tip applies particularly well when you have the Super Jump power up. You may be tempted to jump a lot, but that will give your opponent more openings. As with all games, practice makes perfect! The nice feature of Mynci Beach Volleyball is that you can practice with a friend in the room as well. If you play it often enough you may just be able to develop your own strategies! If you are aiming for the trophy, it is best to submit your score early at the beginning of the month. Mynci Beach Volleyball has a limit of 1,220 for a perfect game. If you wait to submit a score this high, the three top spots may already be taken. You can type dirigibles anytime during the game to make a Kiko balloon float across your screen. You can type turdle once per game to automatically get a turdle power up that won't replace your current power up. This is very useful in sticky situations. 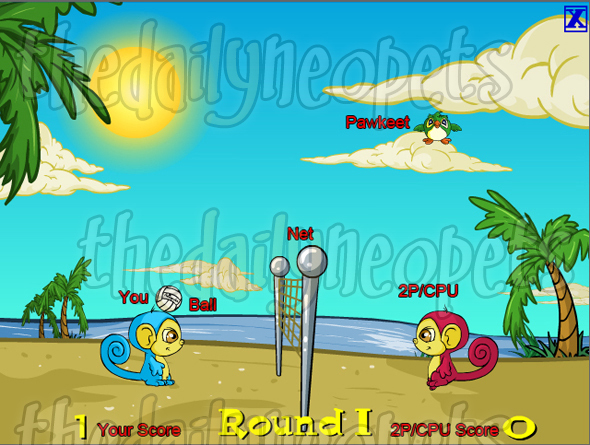 Mynci Beach Volleyball is a great game to play by yourself or with a friend! It's a perfect mix of fun with an added challenge. Practice enough and maybe one day you'll get the avatar or even a trophy! The Snowager is awake. He'll be sleeping in 1 hour, 43 minutes.